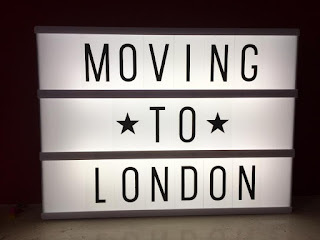 Wow, we can't believe the year is almost over and we have now been here in London for 4 months. They do say, time flies when you are having fun! We are all moved into the Manse and have set about making it our home. It is still quite magnolia so we plan to add some colour to it in the new year, if you fancy joining us for a decorating party? We are learning how to navigate London public transport. We are very close to the tube and have great bus services nearby, so perfect for those wanting to visit us. We have some lovely neighbours and over the next few weeks Centrepoint will be opening their latest supported housing for Care Leavers in London, so we are looking forward to having some young neighbours very soon. As some of you know this term I have been in Bristol 2 days a week for Ministerial Formation, at the fabulous Bristol Baptist College. This has been awesome on so many levels and a little tiring too to be honest, it is quite a commute! 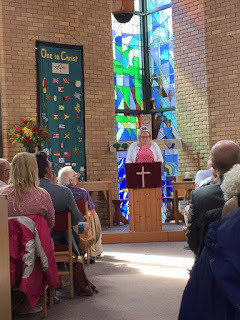 We are slowly starting to make new connections and friends and are super thankful for our siblings at Bloomsbury Central Baptist who have been fabulous at befriending us in this season of change. My beloved has been working full time with an international charity on a specific Christmas based project. This has been great experience, a true insight to the working of a large scale aid operation. This is coming to an end soon though so please stand with us as we pray for the next opportunity for them to serve. Youngest has settled in well to their new school. They have made lots of great friends and are thriving in their new educational environment. They have joined the Brigade company that meets at the church and played Donald Trump (aka Herod) in the End of Year Christmas Celebration. Please pray for them as we have our first Christmas in our new home, with our new community. Eldest wasn't loving their Uni course so they have returned home to Bournemouth. Please pray for them as they discern their next steps and thank God for the provision of a temp job. A massive THANK YOU to all those who came to the Commissioning Service in London on 20th August. We know some of you were disappointed to miss it so here is an exclusive SAVE THE DATE ... Gemma's Ordination - 1st July 2017. We have likened the bringing together of the church and a new minister to that of a marriage! The coming together of two sets of traditions, two sets of history and two sets of knowledge, that often differ! It makes for fascinating worship planning when each of you knows different versions of songs. So we have been using the lectionary to shape our Sunday worship as we get to know each other and have been introducing each other slowly to new things. This Christmas we are using The Bible Society's 'The Well Good News of Christmas' (shown in the illustration above) as we invite our community to join us for a no rehearsal necessary 'pop up nativity and carols'. 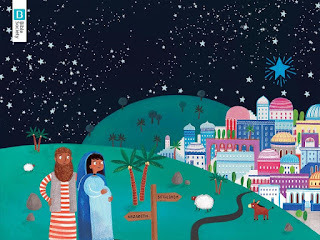 It is a beautifully illustrated work by an ex Falmouth Uni student, Emma Randall. We have a set of new series' on The Sermon on The Mount and Re-imagining Church coming together to shape our gathered Sunday worship for 2017. Together we will be looking at how we do life with Christ in our new form of church family. That which unites us is far greater! We are working with the local Social Prescribing team to seek new ways of battling isolation for our community members. We are exploring a joint befriending scheme with a local 6th Form College. Please pray for this opportunity and for wisdom in the days ahead. We are working towards a Silver Eco Church Award in 2017 and planning new growth for our veggie planters, please pray for us and challenge us in the days ahead. The weekly night shelter is in full flow, every Sunday night we have 30 guests and nearly as many volunteers who help us prepare a 3 course meal and breakfast for our guests as they stay with us. Please do pray for this work.